Price Zone Oscillator indicator is based on the "Entering the Price Zone" article by Walid Khalil and David Steckler. In our last article, we introduced a new oscillator that provides better guidance to buying and selling levels for securities: the Volume Zone Oscillator (VZO). 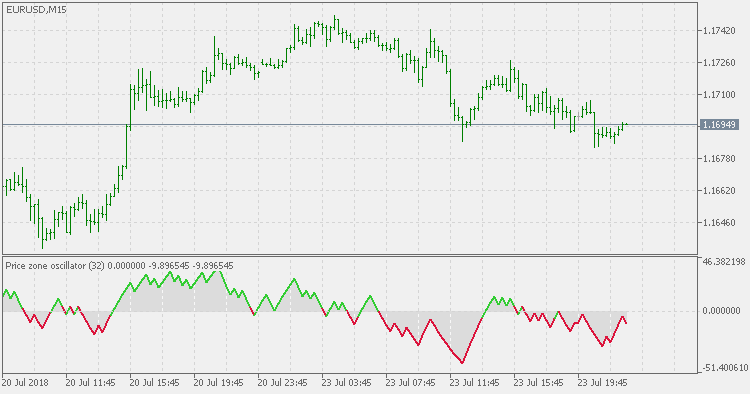 This time, we introduce a similar, complementary indicator: the Price Zone Oscillator (PZO). The formula for PZO depends on only one condition: if today's closing price is higher than yesterday's closing price, then the closing price will have a positive value (bullish); otherwise it will have a negative value (bearish). Price Zone Oscillator = 100 x (CP/TC). CP (Closing position) = X-days EMA (± close). TC (Total close) = X-days EMA (close).